Distribution is dense bush areas in Kwazulu Natal RSA, Mozambique, Zambia and Zimbabwe. 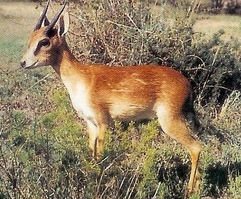 One of the smallest antelope. The tail is long, dark and has a white edge. The upper lip protrudes over the lower lip. Females have no horns and is bigger than the males. Habitat is dry savanna with sufficient undergrowth and scrub for cover, as well as riverine forest and dry bush along riverine systems. Also found in deciduous woodland with thick undergrowth. It uses footpaths in dense bush and is easily caught in traps.